This fascinating history of Israel, from Napoleon's invasion of the Eastern Mediterranean to the founding of the modern State, reveals the vital role of the Anzacs. "Altogether a good read, which I warmly recommend." - Rt. Rev. Donald Robinson. 390 pages. 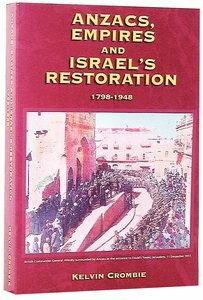 About "Anzacs, Empires & Israel's Restoration"
Kelvin Crombie lived in Israel for almost 25 years, 20 of those as a local guide and researcher based at Christ Church inside the Old City of Jerusalem, and was instrumental in locating the 'Montgomery Bible'.